At the 2016 Annual Meeting of the Clinton Global Initiative (CGI) on September 19, 2016, New-York based nonprofit Project for Public Spaces (PPS) announced a new Commitment to Action to forge partnerships with national and international organizations to expand placemaking in their fields of practice and in the local communities they serve. As part of this 3-year commitment, PPS will work with local community leaders and municipal government to launch pilot projects with each partner organization in 1-3 public spaces by 2019 to build their long-term capacity for placemaking. Partnerships will be announced on a rolling basis over the next year. Lack of access to quality public space is a problem of increasing urgency, given that 66% of the world’s population will be urban by the year 2050, up from 54% today. This rapid urbanization is contributing to dangerously low proportions of public space within cities. Campaigns will include low-cost, short-term improvements to attract more people to a public space, which will set the stage for longer-term infrastructure changes, with subsequent interventions occurring incrementally. These “Lighter, Quicker, Cheaper” design projects typically include adding low-cost amenities to a space, converting street areas into multi-use spaces, or incorporating public art, markets and vending, and/or visual upgrades including landscaping into existing public spaces. Healthy public spaces can be a springboard for revitalizing communities of all kinds. Around the world, more and more industries and organizations are recognizing that attractive, active, well-functioning public spaces can jumpstart economic development, whether in a small rural town or a large urban metropolis. 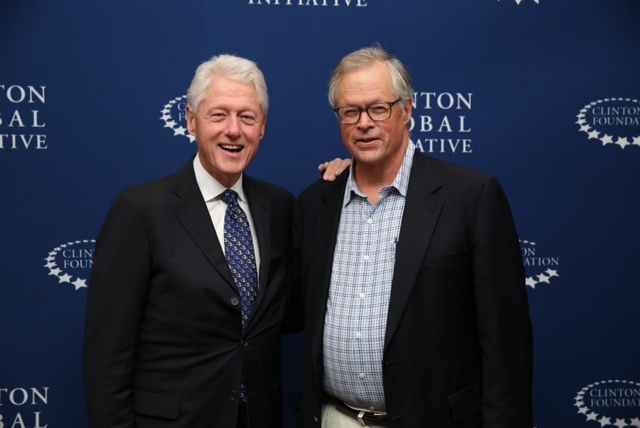 Established in 2005 by President Bill Clinton, the Clinton Global Initiative (CGI), an initiative of the Clinton Foundation, convenes global leaders to create and implement solutions to the world's most pressing challenges. CGI Annual Meetings have brought together 190 sitting and former heads of state, more than 20 Nobel Prize laureates, and hundreds of leading CEOs, heads of foundations and NGOs, major philanthropists, and members of the media. To date, members of the CGI community have made more than 3,500 Commitments to Action, which have improved the lives of over 430 million people in more than 180 countries. For more information, visit clintonglobalinitiative.org and follow us on Twitter @ClintonGlobal and Facebook at facebook.com/clintonglobalinitiative.